Have you heard? Despicable Me 3 Special Edition is coming to Blu-ray & DVD in stores now! The Deluxe Edition that’s available exclusively at Target comes with 20 minutes of bonus content, character cards and temporary tattoos! This fun movie will be a highlight of upcoming movie nights at home. 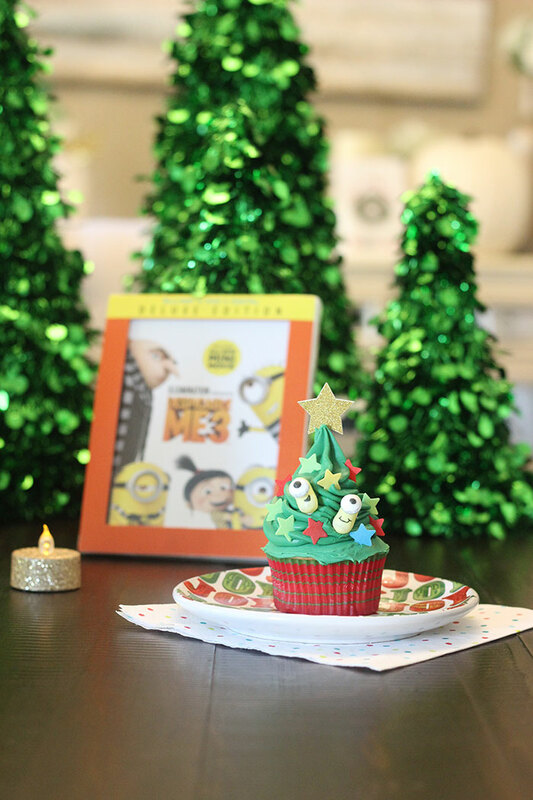 Make these Minion Christmas Tree Cupcakes to make your festive movie night complete! This recipe and movie combo are bound to make the holidays extra special. Bring the best home for in time for the holidays. Despicable Me 3 is the #1 animated comedy of the year! Let the Minions along with Gru, Lucy and their daughters bring home the fun! But, not so fast. Gru’s long lost twin could mean trouble! Don’t miss watching the Despicable Me 3 trailer to get a glimpse and get ready to make these super cute Minion cupcakes to enjoy when you pick up your Despicable Me 3 Special Edition at Target. To start, mix your frosting up with some confectioner’s sugar until your reach your desired thickness. To make your frosting look like a Christmas tree, you will need the frosting to be a little stiff. 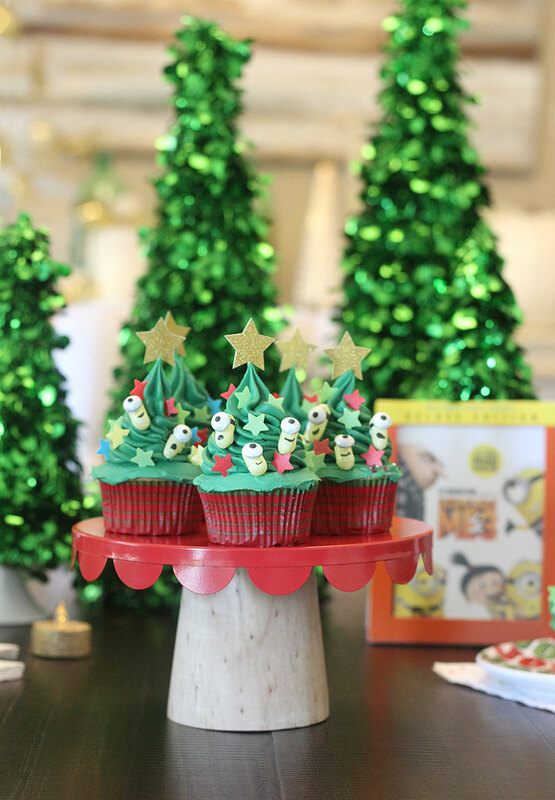 Add a layer of frosting to the top of the cupcake and then use a star tip to frost a “tree” onto each one. Make sure to start in the center and work outward and then upward to a point. Set your frosted cupcakes aside and let them stiffen. Next, we’ll work on making our little Minion ornaments using yellow Mike and Ike candy. Place each one on a toothpick to easily control them while you decorate. Paint a silver circle using the Wilton Edible Accents Metallic Brush around each candy eye and set aside. Use Edible Black Food Pen/Writer to make a smile and a band where the eye will go if you want that extra touch. 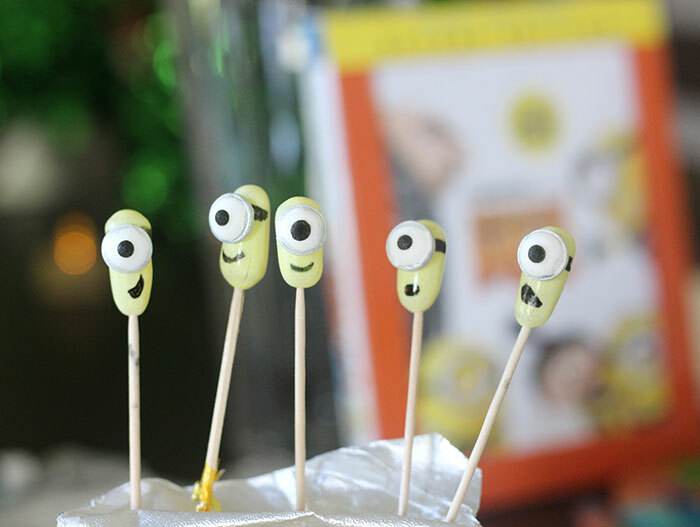 Once you are done with the eyes, use a tiny dab of frosting to adhere the eyes to the yellow candy and let them dry. Once they have set, it’s time to decorate our cupcake trees! 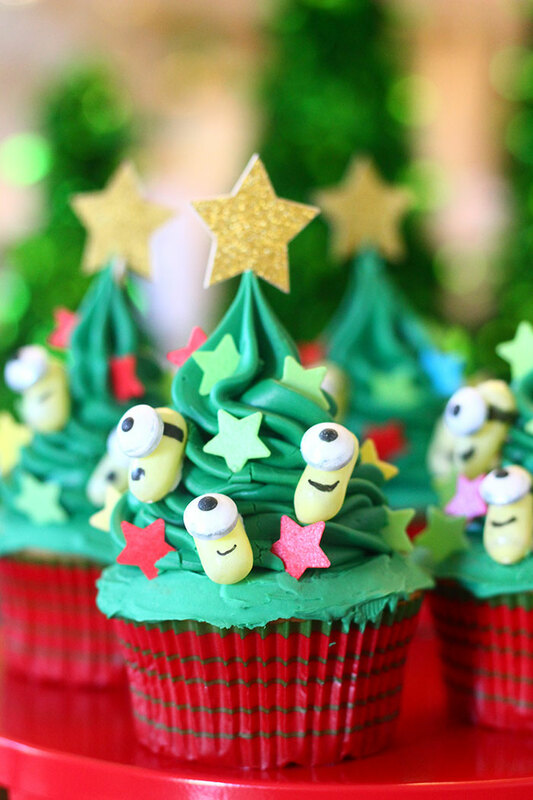 Carefully place 2-3 of the Minion “ornaments” on your cupcake tree using a dab of frosting to keep them in place. Then, carefully place the decorative wafer stars to fill up all of the extra space. 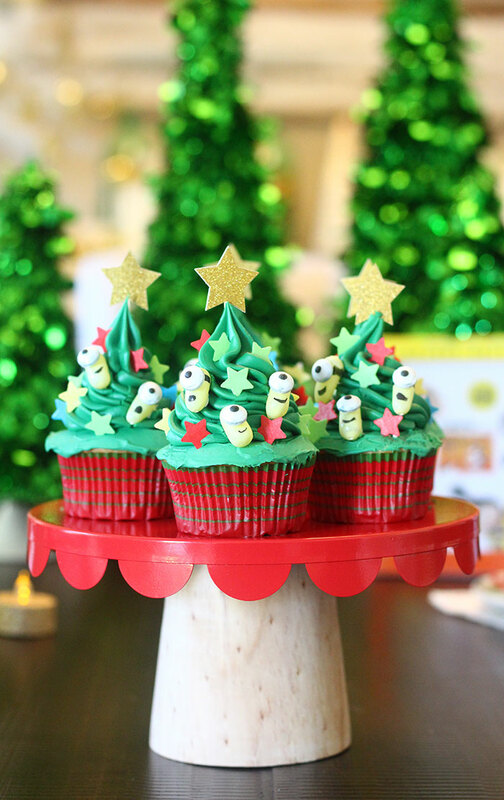 Add Star Cupcake Toppers to make the whole look together. You can also get creative if you don’t have any available. Then, that’s it! You officially have some of the cutest cupcakes ever! Get ready! Despicable Me 3 Special Edition is on Blu-ray & DVD now. Follow @DESPICABLEME on Facebook, Twitter and Instagram! What else would you serve at your Despicable Me 3 Special Edition movie night? I really don't think there is anything cuter than this! I am going to have to give them a try. WE love Minions. This is just the absolute cutest thing ever! My son is so into Miniobs right now! Those cupcakes are adorable! Believe it or not, we still haven't seen this movie yet. =( Need to rectify that with cupcakes and the DVD! What a super cute idea! I love the little minions & the way it looks like a real little Christmas tree! These are adorable. I need to try this! Wow- these are really cute! My kids like the Minions so they would really enjoy these cupcakes! My nephew is a Minions fanatic. He would love these cupcakes. These are cute as can be! Thats very clever to use the Mike and Ikes! Those would work so well. I love your frosting it looks perfect! I can't wait to see this movie! I love your Mike and Ike Minions!! So adorable!! super cute and love the tie-in! What an absolutely adorable idea! My son loves the minions and I know these cupcakes would make him giggle just as much as when he watches them! I find the minion candies so adorable! I thought you bought them ready-made then I read the article and was surprised you made those using Mike and Ike candies with candy eyes! Super cool! This is definitely the perfect treat when you're watching the movie! These cupcakes are so beautiful! I love how gorgeous they turned out and my kids would go nuts over these cupcakes! Aww, what a cute Christmas tree! My kids love minion's so I'm sure they would totally dig this. I never thought to add powdered sugar to my frosting to make it thicker! That's a great tip that just made my Christmas much easier. Those cupcakes are to die for!! I love the minions and so do my kids. 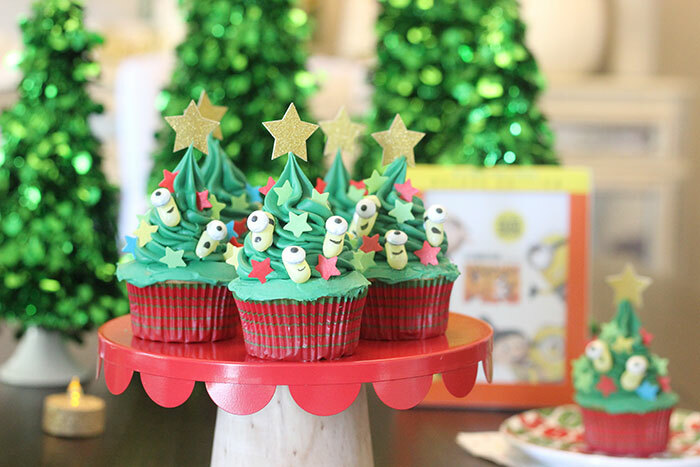 Those are the cutest Christmas cupcakes I've ever seen! 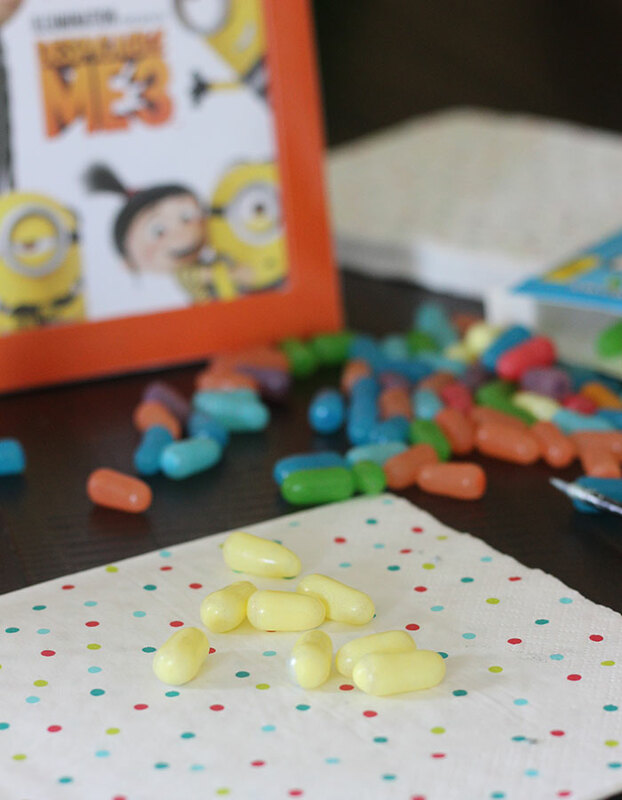 And what a SMART idea using the Mike & Ike candies like that! I so want to make these. They are just the cutest. I am loving your cupcakes. There are simply adorable. I see a viewing party happening in the near future. Those cupcakes are the cutest. I'll need to pick up a copy of Despicable Me 3 for Christmas. These are really cute! They make me smile because them eyes are way too adorable!!! These are SO cute! What a great idea for the kids school christmas parties! These are the cutest cupcakes I have ever seen! What a fun and creative idea. These cupcakes are so adorable. My kids would absolutely love them! These are so cute! I love the minions! They're one of my favorite characters. Now I'm going to have to make some of these. Cutest cupcakes ever! My daughter has gotten into cupcake decorating lately and she'll love making these! Thanks for sharing! hose are the cutest ornaments for a great tree cupcake. I rarely buy Mike and Ikes but for this I have to. I love it also when I don't have to bake the cupcakes. The movie will be the perfect family movie night. Oh and totally doing this! My kiddo loves the minions and this is easy enough for me to make that I could surprise him with it. I'm kind of excited. These cupcakes are so cute. My grandsons love the Minions and would love these. So cute, it was already extra cool with teh Christmas tree and then I noticed the minions and it blew my miind! Very creative! Super adorable! 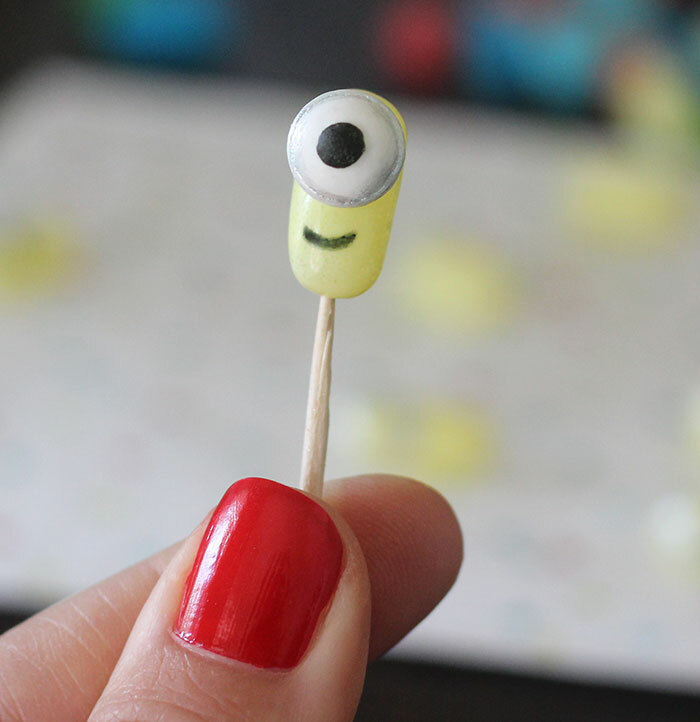 I am seeing lots of cute Minion ideas across the blogs. I love these! What fun! These are so cute! The kids will like making them and eating them.